Regeneration is the title of this polymer and mixed media sculpture from Christine Harris. An artist and art therapist from Virginia, she uses her artwork as “…a record of the pathways that I have taken in my process of becoming.” On her blog she shares the very personal and poignant stories behind her work. She’s featured in the first issue of the new ThePolymerArts magazine. What courage it takes to put so much of yourself in your art! How much do you reveal in yours? Have an inspired weekend. Awesome work. So much sharing of herself… Also thanks for the info and link about the new magazine The Polymer Arts. I sent my check out this morning for my subscription. Have a great weekend! I so enjoy your posts… thanks again. I love Christine Harris’ pieces and the stories behind them. Thank you for this post. Thank goodness for the new Polymer Arts magazine! In reading through the info on the magazine’s website, I am grateful this is going to be a magazine NOT focused on how to condition clay, make a skinner blend, or other beginning stuff! VERY interesting stuff, in a semi-disturbing way–It takes a whole lot of courage to reveal that much of your inner workings, as it were-(-especially, I think, for a mental health professional). These must be very cathartic–something we (I) tend to forget polymer clay can do for us, because we so often focus on the sheer joy of the medium. 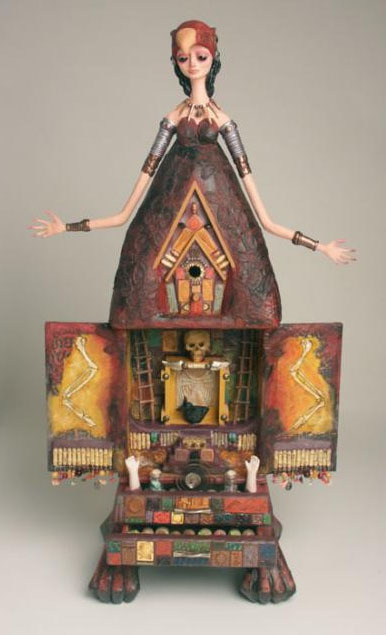 There’s so much to take in on Christine Harris’ sculptures. So much wonderful detail to take in. I purchased the the Polymer Arts magazine and am very pleased with it. Christine’s inner world must be so rich to create this beauty!!! very detailed and delicate work! i would love to try to do some work like that. thanks Cynthia for sharing her with us! Cynthia, thank you so much for including me on Polymer Clay daily! And thanks everyone for the nice comments!